The future 26th President of the United States of America was speaking both figuratively and literally here. “The Strenuous Life” was a strident argument in favor of bootstrap-pulling, nationalism, and masculinity, among other things. But Roosevelt was also in favor of hard work that tested and strengthened the body as well as the mind, the soul, and the nation. His own life had been influenced and improved by a significant number of strenuous pursuits. Sometimes described as a “locomotive in human pants”, he almost turned tennis into a combat sport at one point. He augmented his ostensibly moderate hikes with various obstacles until they’d morphed into proto-Tough Mudder-style challenges. He also trained extensively in multiple martial arts, a good century or so before that became the thing to do. After a particularly demoralizing beatdown on a trip to Moosehehead Lake, a fourteen-year-old Roosevelt asked his father for boxing lessons and received his hearty approval. He was a late bloomer. “I was a painfully slow and awkward pupil, and certainly worked two or three years before I made any perceptible improvement whatever,” he writes in his autobiography. 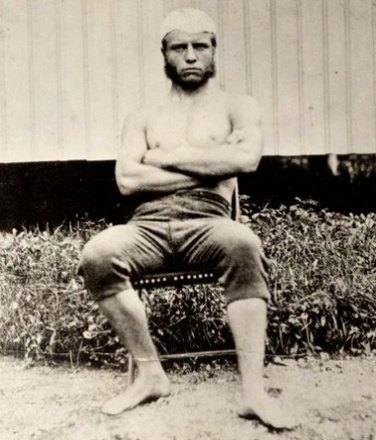 Roosevelt went on to compete in both boxing and wrestling while he was at Harvard, with somewhat less impressive—but arguably no less exciting—results. Teddy Roosevelt as a young man. Boffey then goes on to share a pair of anecdotes from a lightweight tournament held at the Harvard gym in March of 1879: “He won his first match, and also won the crowd with one of those chivalrous acts which sporting fans love. When the referee called "Time," Roosevelt immediately dropped his hands, but the other man dealt him a savage blow in the face. The spectators shouted "Foul, foul!" and hissed, but Roosevelt is supposed to have cried out "Hush! He didn't hear." “In his second match, he met Charley Hanks. They both weighed about 135 pounds, but Hanks was two or three inches taller and had a much longer reach. Roosevelt was also nearsighted, which made it hard for him to see and parry Hanks' blows. "When time was called after the last round," one spectator recalls, "his face was dashed with blood and he was much winded; but his spirit did not flag, and if there had been another round, he would have gone into it with undiminished determination." “From this contest sprang the legend that Roosevelt boxed with his eyeglasses lashed to his head, but some thirty years later T.R. said, "People who believe that must think me utterly crazy; for one of Charley Hanks' blows would have smashed my eyeglasses and probably blinded me for life." 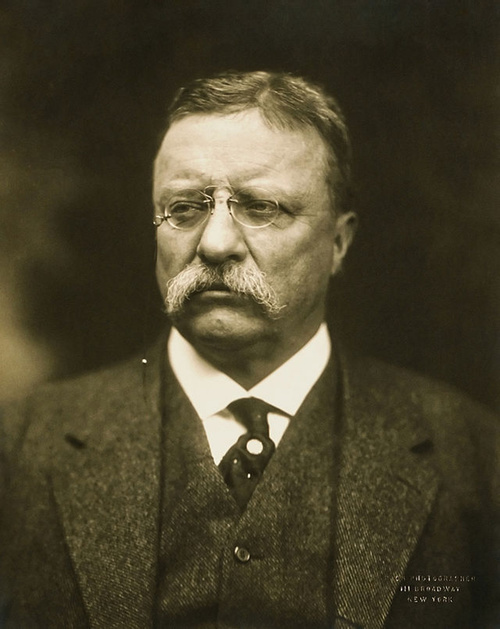 For the majority of his political career as the Governor of New York (1899-1900), 25th Vice President of the United States (1901) and 26th President of the United States (1901-1909), Roosevelt favored grappling. As Governor, he hired the then American middleweight wrestling champion, who was also in Albany at the time, to train him three or four times a week. 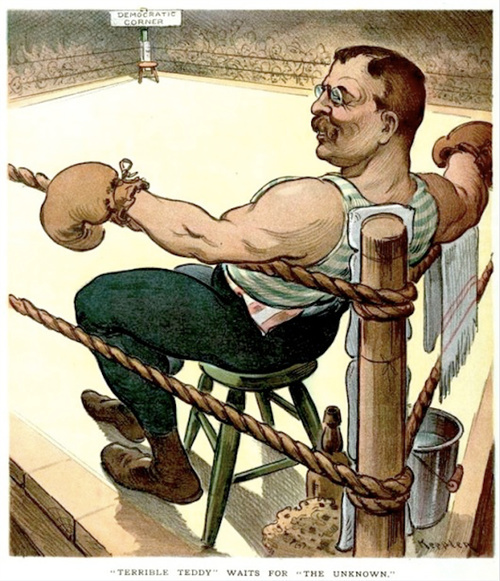 The Comptroller suggested a billiards table, but Roosevelt wasn’t interested and continued sparring with the champ and whoever else would take him on. 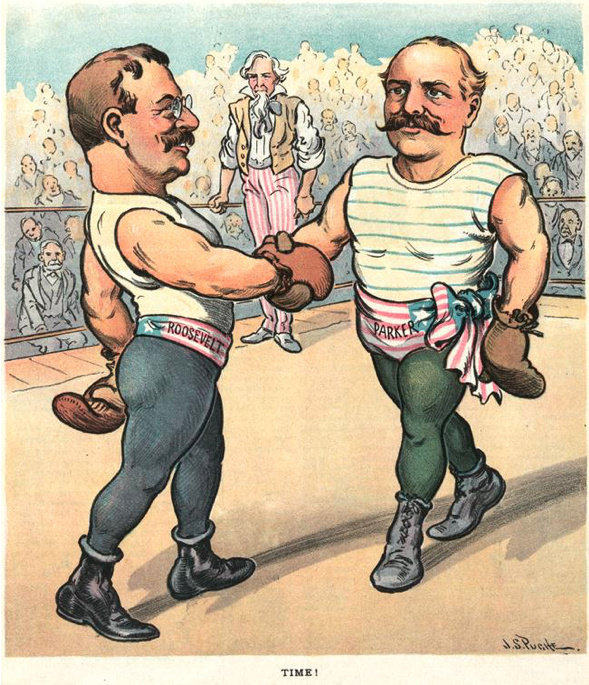 After one particularly brutal battle in which Roosevelt managed to rough up both his opponent (a friend of the wrestler’s who was a rower by trade) and himself, the Governor decided that it would be best if he stopped boxing for the rest of his term. In a further effort to maintain said natural body prowess (and to control his weight, which was expanding in the early twentieth century), Roosevelt took judo lessons from Japanese master Yoshiaki (Yoshitsugu) Yamashita. He’d acquired a taste for the sport when a wrestling instructor taught him a few moves he’d picked up while working in Japan and was eager to learn more. Roosevelt then practiced those moves on every willing participating/victim he could find. “The President’s training partners included his sons, his private secretary, the Japanese naval attache, Secretary of War William Howard Taft, and Secretary of the Interior Gifford Pinchot. When these people were unavailable, then Roosevelt tried tricks on husky young visitors,” Joseph R. Svinth writes in Professor Yamashita Goes to Washington, a 2000 article for the Journal of Combative Sport. An overabundance of enthusiasm was a common problem for Roosevelt. “According to an American journalist named Joseph Clarke, Yamashita later said that while Roosevelt was his best pupil, he was also ‘very heavy and very impetuous, and it had cost the poor professor many bruisings, much worry, and infinite pains during Theodore’s rushes to avoid laming the President of the United States,’” Svinth recounts. Yamashita’s efforts to save the President from himself payed off. Roosevelt became America’s first brown belt while in office and remained the most decorated politician in martial arts until Russian President Vladimir Putin earned his eight degree black belt in karate. He continued happily sparring in his own unique mix of martial arts right up until his trademark enthusiasm earned him a devastating boxing injury in the middle of his presidency.